Today we have a space-filling Peano curve with a dish-like indentation just because it looks cooler that way. More dish-y and more space-filling-y than the H-Tree from Day 57! The model was made in Tinkercad using an image coded by blog.disktree.net. 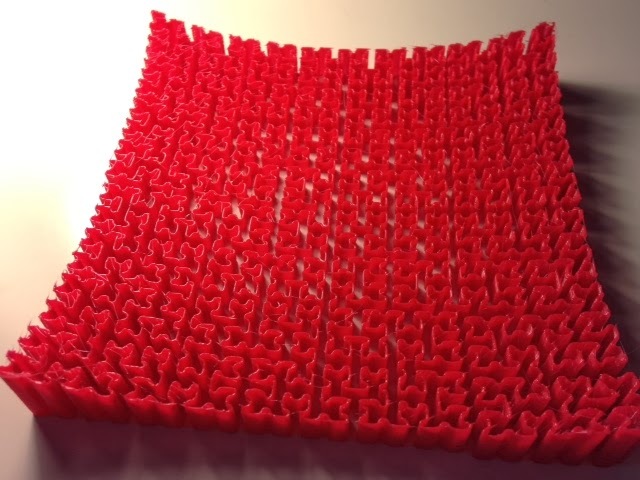 Settings: On MakerWare "low" setting, each layer of the curve prints as one continuous curve! It takes a bit over an hour to print. Technical notes: The image of the Peano curve was opened in Inkscape and then "Path/Trace Bitmap" was applied before saving as an .svg file that Tinkercad could import and extrude.